The Auburn Mosque has landmark qualities in a prominent position beside the Main Western Railway Line. 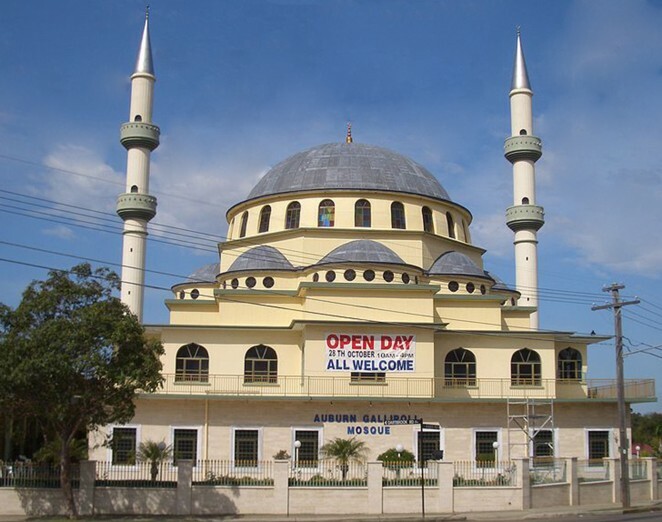 The Auburn Gallipoli Mosque located at 15-17 Gelibolu Parade, Auburn has social significance for the Australian Turkish Muslim community. The Mosque is constructed as a centre of religion for the Islamic community, providing linguistic education, community and cultural activities. The Mosque has landmark qualities in a prominent position beside the Main Western Railway Line and its interiors have considerable aesthetic qualities to both the Turkish community and visitors. The aesthetic appeal of the interiors is enhanced by the various Turkish-artisan designed and imported finishes and fixtures. The mosque exterior’s qualities are enhanced by the marble and stone imported from Turkey. 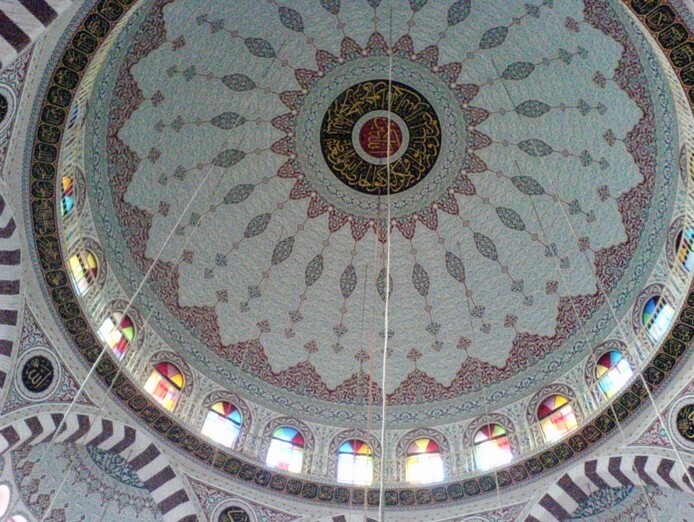 Auburn Gallipoli Mosque is based on the design of the Marmara University Faculty of Theology mosque in Istanbul Turkey. 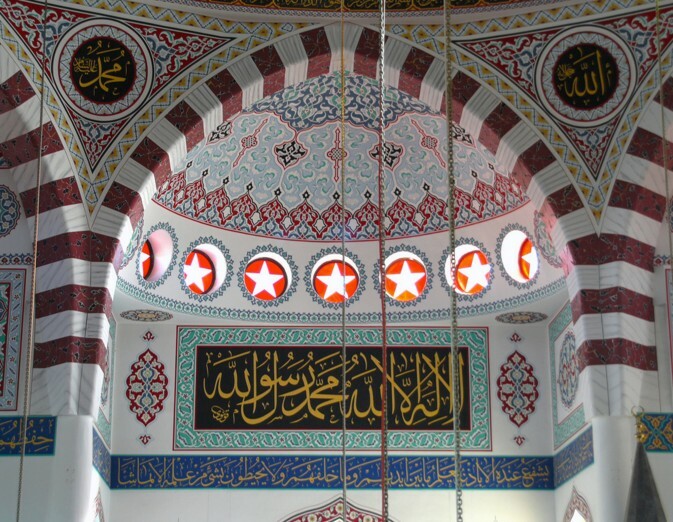 Another replica of the mosque exists in the Turkish city of Eskisehir. The Marmara University Mosque represents a fine example of Ottoman architecture characterised by the use of pointed arches and external materials and colours. The mosque is designed to hold about 1,600 worshippers with an additional 500 capacity accommodated in an external covered courtyard. On Fridays and festive days, the congregation size increased often to around 3,000 worshipers spilling out onto the lawn area. The Auburn Gallipoli Mosque has an area of 4,000 sq m built as a concrete frame with infill masonry exterior walls lined with travertine stone imported from Turkey. The mosque is square in floor layout roofed with of two tiers of domes with a large central dome surrounded by eight smaller semi domes flanked by two minarets. The main dome has an internal circumference of 16.6m elevated 22.6m above the finished floor. The minarets stand a total of 34m high each with two tiers of external balconies. The main dome rests on eight perimeter columns transferring the load equilaterally to the surrounding eight semi domes then onto the perimeter walls. Immediately below each dome are a series of equally spaced windows glazed with coloured glass, lighting the open plan below. The windows provide filtered daylight onto the walls and floors lined with mosaics. Similarly the dome was clad with copper in lieu of the traditional practice of lead which provides a dark deep bluish gray patina that complements the use of stone on the exterior walls of the main mosque. In 2006, the committee commissioned a team of roof specialist from Turkey to reline the dome with lead. The Mosque is designed to facilitate a spiritual and serene atmosphere with architectural features conforming to Islamic daily congregational prayers. The main entrance is located at the rear with two other entry doors on each side directing worshipers through the internal space. The mihrab is a niche inserted into the wall where the Imam (prayer leader) stands to lead the prayer service, and a platform for Friday prayer sermons. The niche is detailed with intricate carved marble work of mimbar which orients worshippers towards Mecca. The construction of the Mosque began in 1986 and was completed in 1999. In 1968, an agreement between the Australian and Turkish governments established an assisted migration program. The influx or new arrivals began slowly and grew steadily in the early 70s, with Victorian receiving a large proportion followed by New South Wales. The immigrants arriving in Sydney were taken to the Villawood Migration Centres and shortly after assisted with accommodation and employment, settling in the vicinity of Auburn and surrounding suburbs. In 1978 the Tukish committee purchase a property at 15 North Parade (now Gelibolu Parade) Auburn. Later that year community prayer sessions began and the house was designated as a masjid (prayer hall). By 1980, two more houses adjacent to 15 North Parade were acquired. Shortly after the committee passed a resolution to build a mosque to satisfy the needs of the growing Muslim community. 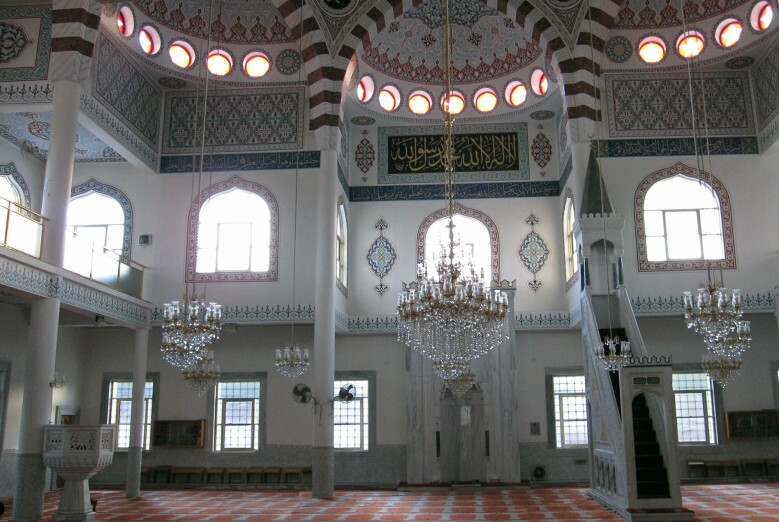 In order to overcome challenges such as lack of immediate funds and expertise in mosque design within Australia, the committee approached Diyanet (The Presidency of Religious Affairs, in Turkey, who administers mosques and imams within Turkey) to provided an appropriate mosque plan from their archives for the site. An Australian architect David G. Evans was engaged to adapt the mosque design to accommodate local planning controls and required building requirements, while Roger Fox was engaged as the structural engineer for the work. In October 1985, Evans travelled to Turkey with a representative from the Auburn mosque committee to develop greater understanding of Ottoman architecture and mosque design, visiting a number of mosques and architectural firms specialising in traditional Ottoman architecture where he was introduced to Ms Leyla Baydar Guven. When Evans returned to Australia he offered a position to Guven to work with him on the project. Guven arrived in September 1986 and started working with David G. Evans & Associate Architects at Hombush NSW. Guven’s involvement was fundamental in ensuring physical changes were carried out to the structure to illustrate symbolism in Ottoman architecture. The main changes were the adaptation of the structure to allow traditional load transfer from the domes to the perimeter walls and re-introduction of the perimeter windows at the base of each dome deleted due to budgetary constraints. Other design elements were simplified during the construction process either due to funding requirements and/or lack of technical skill to implement required intricate detailing. In 1992, Ibrahim Din was elected as the committee president. He brought together a group of Turkish migrants to take over the construction of the project. In 1993, the fountain was added to the design and received approval by the Auburn Council in 1995. The entire fountain was crafted in Turkey and shipped to Australia together with travertine stones for the external walls, marbles for the mihrab, mimbar, door and window frames, and the lecture chair. The construction of the Mosque began in 1986 and was completed in 1999. The works were primarily funded by the local Muslim community, who collected approximately $6,000,000 over thirteen years. The Auburn Gallipoli Mosque has been named in honour of the unity and early relationship developed between the Turkish and Australia troop in Gallipoli (Gelibolu) during World War I. Although the early contact between Turkish and Australians were confrontational during a mutual respect and admiration grew between the two cultures. After the war the relationship developed with close diplomatic ties. Today the mutual admiration is followed through with the Turkish flag shown in ANZAC parades and the naming of the Mosque.